If you follow me on Instagram, you may have seen this photo pop up recently. 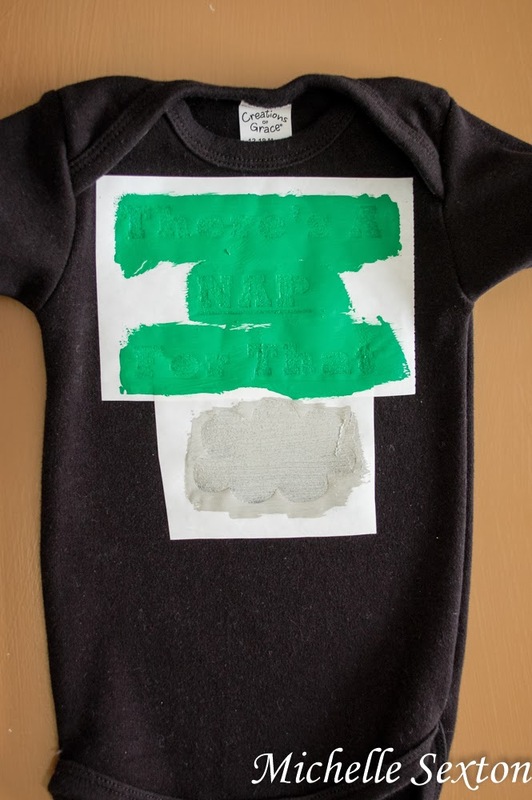 We painted onesies for the mother-to-be at a friend's baby shower recently. Yeah, I know: genius! Why didn't we think of doing this sooner??? 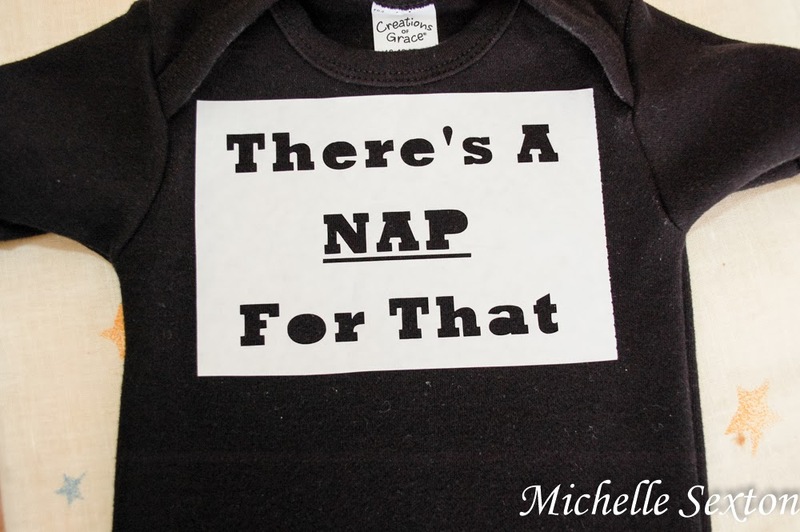 So anyway, after scrolling through Pinterest to gain a little inspiration, I came across the phrase, "There's A Nap For That." "How perfect is that?" I thought. 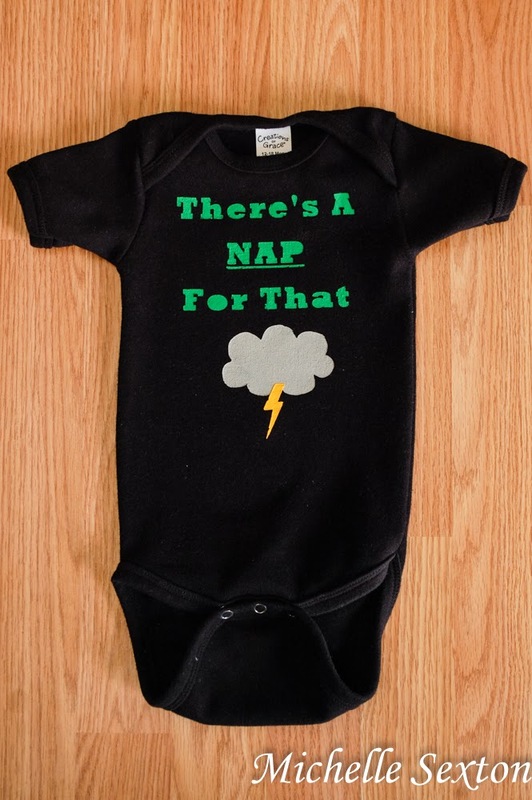 And so, I painted a onesie with that phrase, and added a thunder cloud and a lightning bolt. 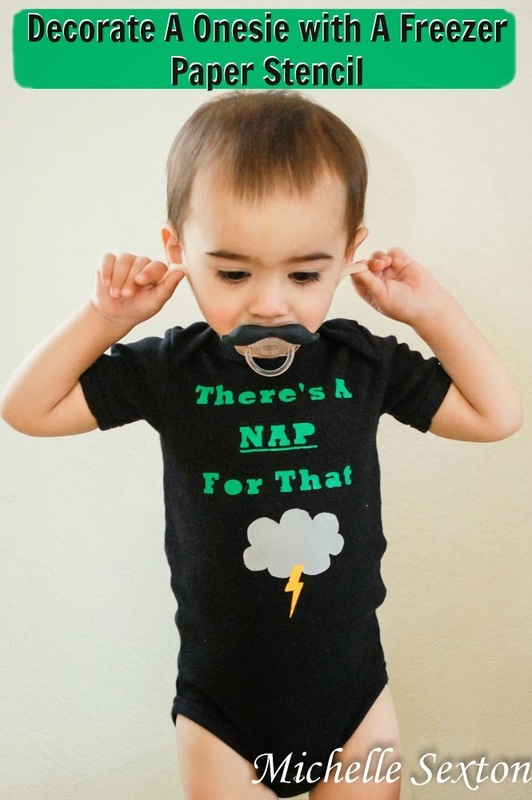 I loved it so much, I decided that I REALLY needed one of these for my own munchkin. So, I put together a stencil pattern in Silhouette Studio (the program that came with my Silhouette Cameo) and had the Cameo cut it out using freezer paper. Super easy. Do you want to make one too? Awesome. I knew you did. Wait, you don't own a Silhouette? No worries. 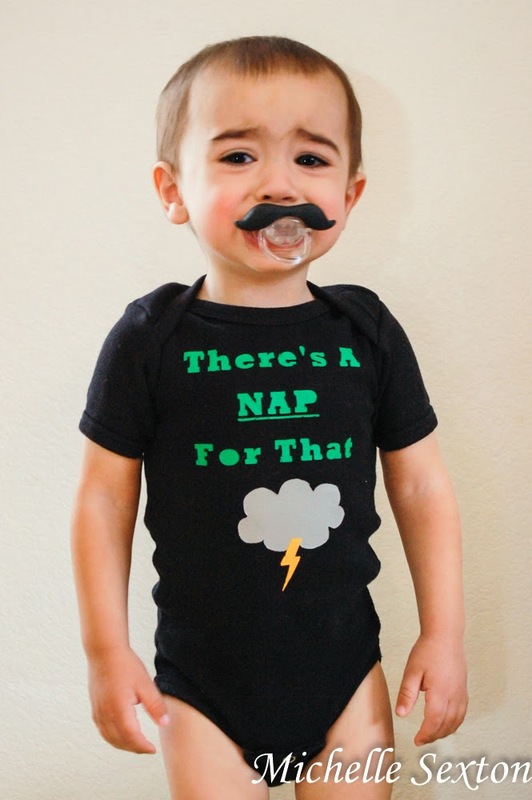 I've also included a way to make this hysterical onsie without a Silhouette, too. See? I've got you covered. Oh wait, did you guys even know that I have a Silhouette? I do! You want to hear the terrible part? We bought it about two and half years ago, but I haven't used until a couple of weeks ago. Gasp! I know! The reason I hadn't used it until recently was due to the fact that it was purchased about a month prior to the day Cheese was born. I had serious pregnancy brain back then and there was no way I could think about anything creative. Yeah, so my husband used it a couple of times to create a couple geeky role playing games and it got set aside until recently. Such a sad story, but the good part is we are back in Silhouette business now! Woo hoo! Ok, friends, you have two ways to make this: with a Silhouette or with just a Printer. Obviously, if you don't have a Silhoutte, you should go for the printer option. If using a Silhouette, download this file. Place the sheet of freezer paper onto the cutting mat, shiny side up. Cut the freezer paper using the Silhouette. Carefully peel the freezer paper stencil off the cutting mat, making sure not to tear the freezer paper. If using a printer, download this PDF and print it. Tape the printed template onto a cutting mat, place the freezer paper (shiny side down) over the printed template and tape it down as well. 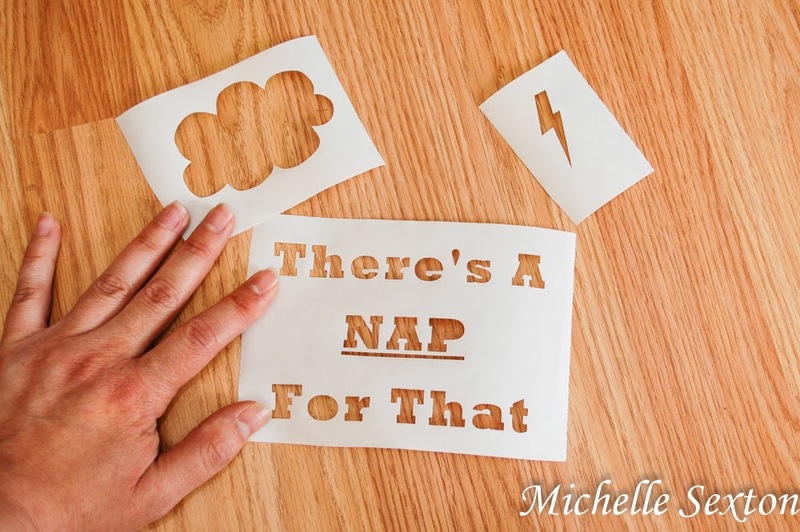 Using an exacto knife, cut around the printed letters and shapes to create a freezer paper stencil. Ok. So, at this point, you should have a super awesome freezer paper stencil that was either cut with the Silhouette or by hand. It should look like the one in the photo above. Cut the cloud, lightning, and letters into three separate sections. Using the foam brush, paint a thin and even layer over the letters and cloud in an up-down motion. (Side-to-side motions tend to make the paint seep underneath the stencil.) Avoid painting a thick layer of paint over the stenciled areas. 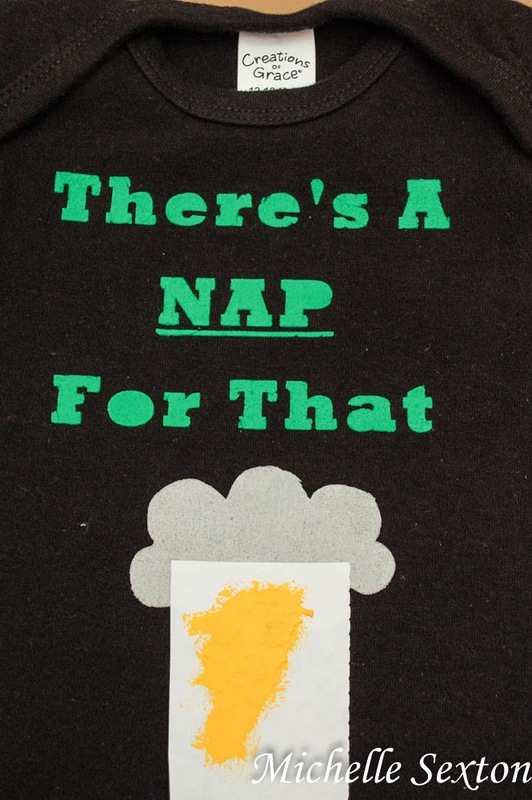 Leave the stencil on the fabric and allow to dry. Add additional coats, if needed. Once the paint is completely dry, gently and slowly peel the stencil freezer paper off the fabric. Press your fingers on the the painted shapes and letters as you peel the stencil from the fabric to prevent the paint from peeling up, also. 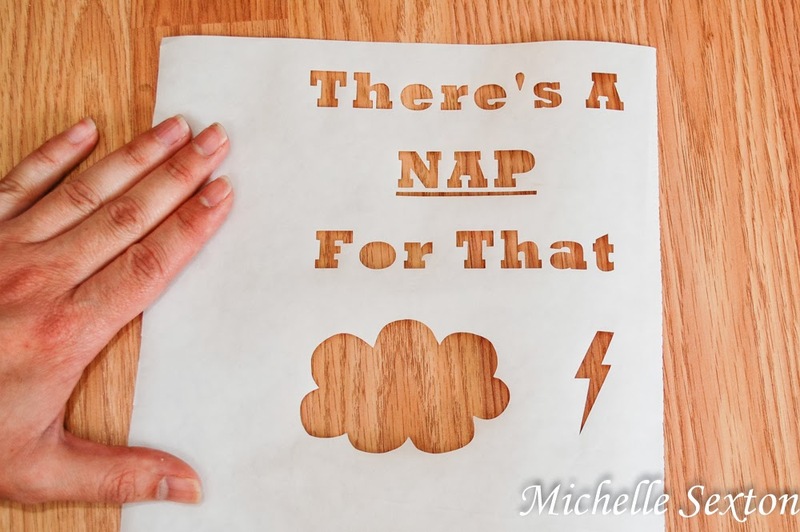 Gently iron the lightning bolt freezer paper stencil to overlap at the bottom of the cloud. 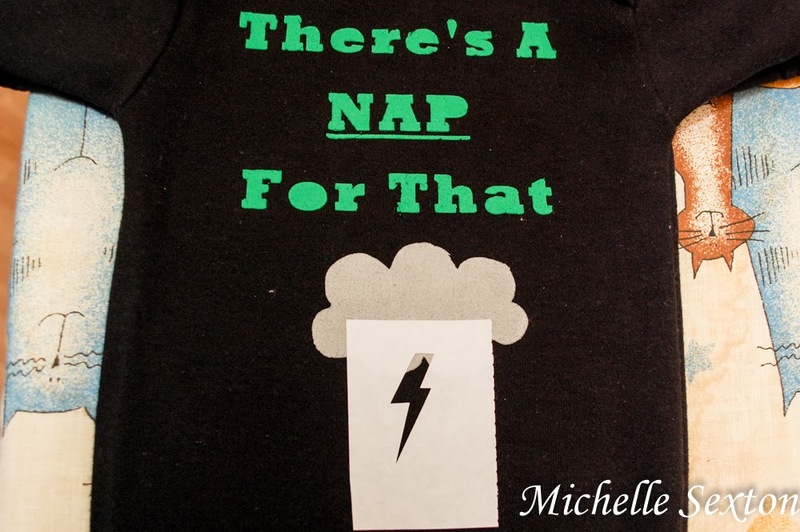 Paint the lightning bolt and allow to dry completely before removing the stencil from the fabric. So much fun, right? 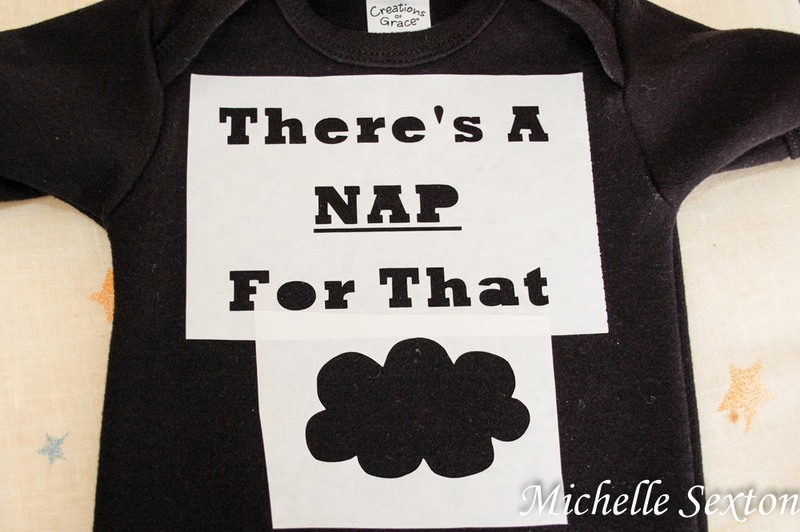 I had a ridiculous amount of fun making this onesie. I could hardly wait until the next day to put it on Cheese! P.S. If you don't have a Silhouette Cameo, but you'd like to get in on the stencil-creating fun, Amazon has a great deal on a Starter Kit Bundle for under $300! This awesome tool can be used to create custom vinyl wall clings, cool printables for the kids and you can even swap the blade out for really awesome glitter pens and stuff to make super-creative crafts. Please remember that you're free to use the ideas and materials in this blog for your personal use, but not for commercial use. Won't the paint wash off in the wash machine?? Adorable. @handj, there are also fabric/textile mediums you can add to your acrylic paints to improve adhesion and reduce the likelihood of cracking, peeling etc. Heat setting is also usually recommended.